Sylvaner is a grape that unfortunately lacks clear markers. And today it is not enough to have qualities to sell. To do so consumers must also recognize the grape variety 99 times out of 100. 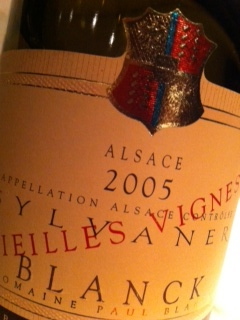 Therefore, Alsace Sylvaner shows a lot of self-confidence simply by being itself. Blunt, strong and good. 2005 Sylvaner Vielles Vignes from Paul Blanck in Kientzheim has a slightly spicy aroma of bay leaves and coriander and a fruity character of apricot and peach. The taste is firm yet light and elegant, with generous acidity and good length. Ideal for food, no matter what kind. Price: € 10.